Desirable West End PCB! Private balcony. Steps to the beach. This condo is a one bedroom and is an excellent quality beach front choice for a couple or a couple with up to three children. It is owner managed so no additional management fees. Rent, VRBO booking fee, clean and tax only. And we care about your experience! The rent price includes a discount to help cover the VRBO fees. Compare. Best Value. Check the reviews. No adult groups or student groups. We only book SAT to SAT in summer! Beach Service included March through Oct.
Celadon is a family oriented non-smoking property. This includes balconies and our unit and is strictly enforced with fines/eviction if noncompliance to this and other Celadon property regulations. This is one reason Celadon is so desired by families. It is a place for a romantic getaway or one you want to bring your children to enjoy the ocean experience. This unit is perfect for couples or small families. No pets, smoking, no one under 25 or groups/parties as per Celadon property regulations. 1) COMFORTABLE FURNITURE: Two leather recliners and a Lazy-Boy sleeper sofa (sleeps one). The King Bed has a very comfortable high quality mattress ...have received many high marks for comfort. It is important to be able to rest well when you are away from home! Even the bunk beds have memory foam topped mattresses. Children need to sleep well also! 2) WELL EQUIPPED KITCHEN AND STAINLESS STEEL APPLIANCES. 4) Unit is DESIGNED TO MINIMIZE ALLERGY ISSUES... uncluttered decor with no carpet or artificial plants to collect dust etc, top grade allergen/dust mite etc covers on mattresses. 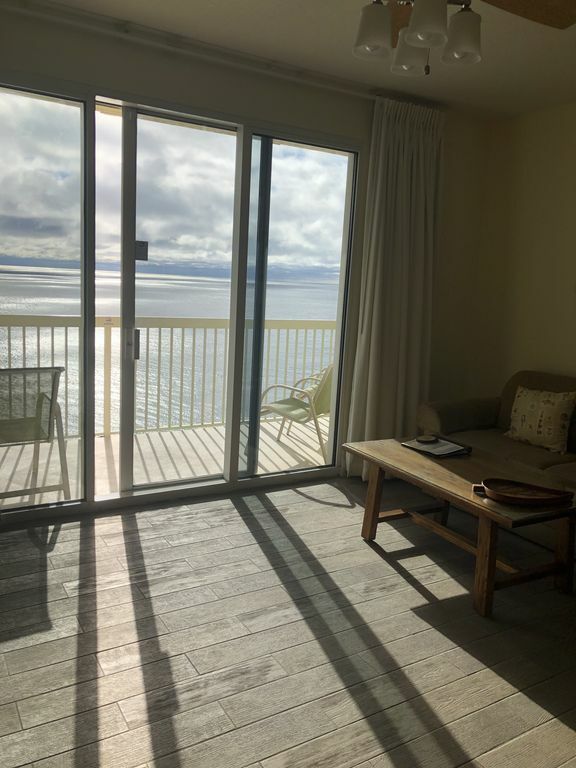 CELADON BEACH RESORT is located in the most desirable ''quiet'' west end and is only a couple of miles from both Pier Park and Frank Brown Recreation Center. Approximately 15 minutes to the west is Scenic Drive 30A with the quaint towns of Seaside and Watercolor as well as Grayton Beach and Rosemary Beach. San Destin, with its premium outlet mall, is about 25 minutes away. RESORT AMENITIES INCLUDE: Free covered parking with a covered and climate controlled walkway to/from the garage; two pools, one beachside, one indoor/outdoor, each with jacuzzis and shower facilities; fitness center; tennis court, gazebo with picnic table and grill, on-site rental for jet ski, parasail, beach lounge chairs and others water activities; high speed internet; and one of the largest beach fronts in Panama City Beach. Experience why the emerald beaches have been rated as one of the top ten beaches and Celadon Beach Resort as the Best on Emerald Coast! Note: Celadon is a family oriented non-smoking facility. No Pets. Must be 25 years old or with parents staying in the unit. No smoking on property or in condo. Celadon charges a one time parking fee of $20 that is paid directly to Celadon and is not included in the quote. Less than 40 steps from elevator to white sands beach. Great if you have small children. Private balcony and great views! Celadon is one of the 'fewest steps to the sand' properties in PCB....a big plus! AND the least crowded. One time $20 parking ticket to be purchased from Celadon on-line. Air conditioned. High Speed. Close to the sand!!! Steps to the elevator and steps to the beach! The balcony is private. You cannot see other balconies (or they you). Great sunbathing deck west of the pool area located on 4th floor from ground... good breeze and views! Having the beach chairs was great. We had a wonderful week. The weather was great, and the sunsets were beautiful! We LOVED the view from the balcony, and it was so nice just to sit and listen to the ocean. We would definitely stay here again. Fabulous location! Condo very nice, easy parking access. Accommodations and beach access terrific! Great stay! We will be back!! We had a fantastic time in Panama City Beach. It was great having a clean, safe place to stay. I can't say enough positives about the condo. The view is breath taking. It was clean, stylish and very roomy. Having a washer and dryer was a plus. The bed was so comfy I wanted to bring it home with me! The amenities were wonderful. Two great pools and right on the beach! It was a beautiful unit. Wish stunning views of the ocean and sunset's. We definitely will be back. Celadon is the last high rise west of Pier Park (two miles west). It is about 8 miles to 30A and 98 where you turn to go to Watercolors, Rosemary Beach, Inlet Beach, Grayton, Seagrove. The 30A area is great to visit, but you will love to return to the Quiet West End and less crowded beach! There is a one time $20 parking fee charged by Celadon Condominiums and paid through their web site prior to arrival. Information regarding how to pay this fee will be provided with check-in information. $200 refundable security deposit. Family Resort. You must be 25 years old to rent at Celadon or staying with parents. No Pets. No smoking. No additional guests without prior approval. No parties. No Exceptions.